Psychological treatments for chronic pain are increasingly available alternatives or adjuncts to pharmacologic and other medical approaches. A variety of psychological approaches have been developed, and many have substantial empirical support for their efficacy. 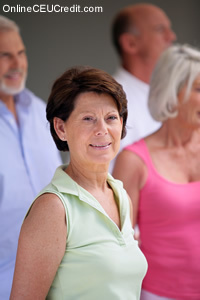 Unfortunately, despite data suggesting the high prevalence of pain concerns among older adults, associations between pain and lower quality of life in this population, and associations between pain and health care system utilization and costs, little research has been conducted to specifically assess the efficacy of psychological treatment alternatives in this population. One particularly promising psychological treatment approach is cognitive-behavioral therapy. This treatment approach includes a wide range of interventions provided in varied clinical settings that share a common theoretic background, namely cognitive-social learning theory.6 The efficacy and effectiveness of these approaches have been extensively investigated as both "stand alone" treatments for chronic pain, as well as in the context of multimodal and multidisciplinary treatments. Overall, these approaches have strong empirical support as effective treatments for persistent pain conditions. There are several notable aspects of a cognitive-behavioral approach to pain management that may make it particularly applicable to the treatment of older individuals. For example, the approach is inherently flexible and may lend itself to modifications that take into account important developmental and other factors that may be idiosyncratic or important in understanding the experience of pain among older adults. The cognitive-behavioral approach takes into account the multidimensional experience of chronic pain and simultaneously targets lifestyle factors associated with management of the painful medical condition, disease- associated impairments and other functional disabilities, and associated problems with affective distress and comorbid psychopathology, in addition to targeting pain reduction. This perspective encourages application of a more comprehensive and prescriptive treatment approach that can take into account the specific problems of older individuals, realistic expectations regarding outcomes, the settings in which older adults live, and other important factors. Finally, the approach explicitly acknowledges the range of cognitive, affective, behavioral, social, and biologic factors that may contribute to the experience of pain and associated problems and concerns. Clinically and empirically based observations of the role of these factors in explaining the experience of chronic pain among older adults can be used to inform specific refinements in a cognitive-behavioral approach to pain management that should improve outcomes. The cognitive-behavioral perspective on pain traces its roots to the work of Fordyce, who hypothesized an important role of social and other environmental contingencies for observable demonstrations or expressions of pain and the perpetuation of these behaviors. This operant conditioning model of chronic pain influenced the widespread development of residential pain rehabilitation programs that encouraged behavioral activation and physical reconditioning and reduced reliance on pain medication. Also informing the cognitive-behavioral perspective and cognitive-behavioral therapy for pain is the gate control theory of pain and the biopsychosocial model. Both models support the multidimensional nature of the experience of pain. The gate control theory explicitly acknowledges the roles of cognitive-evaluative and affective motivational processes, in addition to sensory- discriminative or nociceptive input, in determining an individual’s perception of pain. The biopsychosocial model provides a more general framework for explaining the interrelationship among biologic, psychological, and social influences on individual’s experience of illness. In their landmark book, Turk et al expanded on the operant conditioning model and integrated key components of the gate control theory and the biopsychosocial model and offered a cognitive-behavioral perspective on chronic pain and its management. This learning-based model emphasizes the central role of individuals’ idiosyncratic cognition, particularly their pain-relevant appraisals, attitudes, beliefs, coping processes, and problem-solving competence, as determinants of the development and perpetuation of the internal and subjective experience of pain and associated functional disability and affective distress. Turk and Rudy have outlined several key assumptions of this perspective. These principles emphasize that individuals play an active role in determining their behaviors as a function of their appraisals and other cognitive processes, that there is a reciprocal relationship between individuals’ cognition, their behavior, and other emotional and physiologic responses, and that there is a similar reciprocal relationship between individuals’ behavioral responses and environmental events. The primary goal of cognitive-behavioral therapy for pain is to promote the adoption of an active and constructive problem-solving approach to tackling the many challenges associated with the experience of persistent pain. A shift is encouraged from an overarching perspective of helplessness and hopelessness with regard to these challenges to one of personal mastery, responsibility, self-control, confidence, and optimism. This reconceptualization is reinforced through application of a psychoeducational approach to therapy that encourages the development of a credible understanding for the perpetuation of pain, disability, and distress. It provides a model for cognitive-behavioral treatment that emphasizes individuals’ personal learning histories and idiosyncratic experiences. The development of an effective self-management approach must be reinforced by a collaborative process that includes acquisition and practice of a range of cognitive and behavioral skills. Specific efforts to promote generalization and maintenance of treatment gains also are incorporated in the treatment. Consistent with the principles of the cognitive-behavioral perspective outlined above, effective therapy should be multidimensional in nature, targeting the commonly associated problems of declining productive and pleasurable activity, emotional distress and suffering, and other specific problems such as mood and anxiety disorders, sleep dysfunction, obesity, physical deconditioning, and marital and family dysfunction. Treatment should target the emotional, cognitive, physiologic, and behavioral dimensions of individuals’ problems in order to be effective. Finally, treatment should encourage the active participation of individuals in the treatment and foster a collaborative, problem-solving approach. Specification of an individually tailored plan for treatment should be informed by completion of a comprehensive assessment and the development of an integrative conceptualization of the individuals’ problems and hypothesized contributors to these problems. The cornerstone of the assessment process is a thorough clinical interview, but it is commonly complemented by the administration of a range of standardized self-report measures that facilitate the assessment of the parameters described above. Other assessment approaches such as psychophysiologic evaluation, self-monitoring and diary methods, and direct observation procedures are also often incorporated. The psychological assessment and conceptualization are often but one important component of a multidisciplinary assessment and treatment planning process in many clinical settings. As was already mentioned, cognitive-behavioral therapy encompasses a variety of specific learning-based therapeutic techniques that are consistent with the goals of improved self-management of pain. Education is central to most cognitive-behavioral treatments and may be relatively formal in some settings. Patient-oriented reading assignments may serve an important role in this context. Treatment is most often built on a collaborative process that leads to specification of quantifiable and measurable goals for treatment that are consistent with identified problem domains or areas for improvement. Examples include reduction in pain medication use, increased adherence to an exercise regimen, increased social activity, and return to work. A key strategy for promotion of these goals is contingency management, a strategy in which social reinforcement is delivered contingent upon the accomplishment of previously developed inter-session goals. Contingency management is also a key strategy for promoting adherence to skills practice and other treatment recommendations. Relaxation training and training in self-regulation of physiologic arousal via biofeedback are quite common components of cognitive-behavioral therapy for pain. The primary biologic rationale for this intervention is reduced physiologic arousal, particularly muscle tension, to reduce hypothesized contributions to nociception, as well as to the perception of pain. Reduction in anxiety and stress-related contributions to pain also are commonly cited. Reinforcement of a developing perception of control over pain is highlighted. Additional cognitive and behavioral techniques that are commonly incorporated include coping skills training (eg, use of distraction, pacing, rest-activity cycling), behavioral rehearsal (eg, to practice newly acquired coping skills in the treatment session or through homework assignments), cognitive restructuring (eg, to reframe pain perception as a more benign experience), assertiveness training (eg, to promote more appropriate expression of negative mood), and communication training (eg, to reduce pain-contingent solicitous responding from a spouse). Cognitive-behavioral therapy is most commonly administered in individual or group outpatient treatment sessions. Models for couples and family treatment also have been described.16 Treatment usually is limited to no more than 10 60- to 90-minute sessions. Consistent with other learning-based therapies, sessions are structured and typically include three phases—a review of the previous session and intersession homework assignments, education and/or training in a new concept or skill, and establishment of intersession goals and homework assignments. As described above, a collaborative, problem-solving style of interaction that promotes or encourages the individual with pain to take an active role throughout the treatment process is emphasized. - Kerns, Robert, Marcus, Kelly & John Otis; Cognitive-behavioral approaches to pain management for older adults; Topics on Geriatric Rehabilitation; Mar 2001; Vol. 16; Issue 3. The preceding section contained information about cognitive-behavioral approaches to pain management for older adults. Write three case study examples regarding how you might use the content of this section in your practice. How do the gate control theory and the biopsychosocial model of pain relate to cognitive-behavioral therapy? Record the letter of the correct answer the CEU Answer Booklet.